Ahead of the official launch of iOS 10 tomorrow, apps designed for the new operating system update have started hitting the iOS App Store, including those that will be available in the Messages App Store. 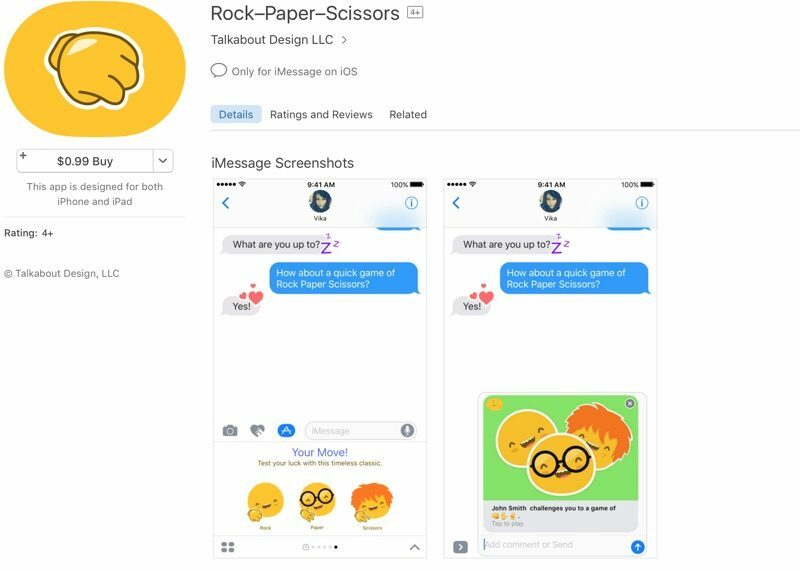 Rock-Paper-Scissors [Direct Link], for example, a Messages app that allows two people to play a classic game of Rock, Paper, Scissors right in Messages, is now in the App Store. It is not, however, showing up in the dedicated Messages App Store, which will presumably launch tomorrow. Other apps for Messages, like Snappy Browser, are also starting to become available. The Messages App Store is an app storefront located within the Messages app, accessible on a device running iOS 10 by tapping the app icon, opening the app drawer (tap the icon that looks like four circles) and then choosing the "+" store icon. Using the Messages App Store, iOS 10 users will be able to install a huge variety of sticker packs and apps to enhance the chat experience in Messages. Stickers are used a lot like emoji but can be animated and stuck on top of chat bubbles, photos, and more, while apps can do things like offer weather updates, a Safari browser for looking things up without using Messages, provide collaborative food ordering tools, and more. iOS 10 offers a huge number of new features for developers, and in addition to Messages apps, we'll also be seeing apps that can take advantage of the new features in Maps and apps that offer third-party Siri support. Expect to see significant app updates coming out throughout the week, leading with tons of app releases tomorrow. So we have a $750 smartphone in order to play rock, paper, scissors. Ugh. Apparently you have to pay $0.99 first. And so it begins... Hope it won't be too flooded with nonsense like this. Don't get your hopes up. I'm currently writing an app that translates all text into Morse Code. With fart noises. I will be settling all my disputes and decisions using this app from now on. The app store is slowly turning adults into infants. Surely the CPU power of iPhone today could be put to better use. I love how the first thing MR posters do when confronted with mindless fun is turn their nose and act like they're above it. Remember when MSN had games to play with your fellow MSN?